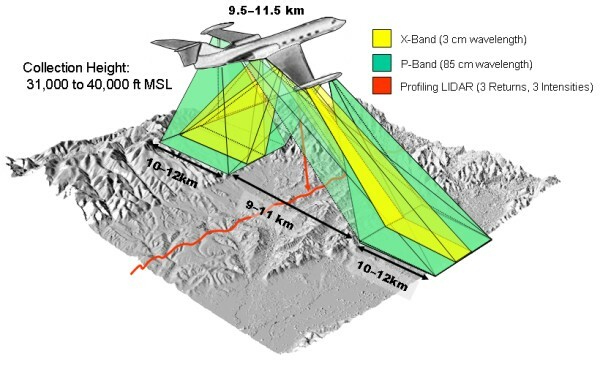 The University of Iowa filed an application with exhibit for special temporary authority to transmit a 2.5 MHz signal from an aircraft trailing-wire antenna to measure the thickness of Alaskan glaciers. The antenna is 60 meters long. Transmit power is 10 watts. The modulation is specified as a 1 MBytes/sec. FM chirp 6 microseconds long with a duty cycle is 1%. Amateur Radio operator Frank Ravenswood filed an application with exhibit for special temporary authority to conduct experiments with spread spectrum on HF and VHF Amateur Radio frequencies. Operation will be from Hillsboro, Oregon in several Amateur bands between 1.8 and 54 MHz. ATSC Laboratories filed an application with exhibits for experimental license to conduct white-space equipment tests within the television broadcast bands 54-72 MHz, 76-88 MHz, 174-216 MHz, 470-608MHz, and 614-698 MHz. “ATSC will conduct research and experiments of fixed and personal/portable devices within the White Spaces to analyze the potential utility and feasibility of such operations and technology. In particular, ATSC wishes to determine the impact of such operations and technology in a densely packed ‘in use’ channel structure, consisting of underserved rural and urban populations.” Operation will be in Reno, Nevada. Amateur radio operator Brian D. Justin, Jr. filed an application with exhibit for special temporary authority to transmit on 70 MHz from Bedford, Virginia in support of trans-Atlantic Sporadic E propagation (E-skip) testing. Curtiss-Wright Controls filed an application with exhibits for experimental license to demonstrate its ground-penetrating 3d-Radar to prospective customers. Curtiss-Wright says it filed a Part 15 waiver request with the FCC in June 2010 seeking authorization to operate its 3d-Radar for non-federal use. That request was granted on January 11, 2012. The device, however, does not yet have FCC equipment authorization, thus this application. Operation will be at various, yet to be determined, locations and in the frequency range 140-3000 MHz. Lockheed Martin filed an application with exhibits for experimental license to conduct developmental testing of an AXCP ocean probe designed for NOAA and intended to profile water velocity and temperature. The probe’s transmitter has an integral monopole antenna that points toward the sky. In normal operation seawater acts as the ground plane. Operation will be at Marion, Massachusetts on 170.5, 172, and 173.5 MHz. NorthWestern Corporation, an electricity and natural gas utility, filed an application with exhibit for experimental license to test the usefulness of white-space frequencies and technologies for real-time communications with remote smart grid devices. “This includes point-to-multipoint wireless communications to capacitor banks, reclosers, voltage regulators and voltage sensors. This specific project is focused on improving power quality, power efficiency and outage restoration to rural customers in Montana along an unusually long distribution line.” The utility says it “has already installed smart grid devices which behave autonomously along the line without communications. Although power quality has improved, the line continues to experience problems. The expectation is that real time communications coordinated among the existing smart grid devices will improve power quality and efficiency.” This experimentation is supported by a grant from the U.S. Department of Energy. Operation will be on up to four 500 kHz-bandwidth channels between 174 and 216 MHz in the vicinity of Philipsburg, Montana. Fugro Earthdata Inc. filed an application with exhibits for special temporary authority to operate in support of research on determining the thickness of multiyear arctic ice associated with offshore ice flows using GeoSAR Interferometric Synthetic Aperture Radar (IFSAR). The applicant says P-band radar is known to penetrate several tens of meters into glaciers. 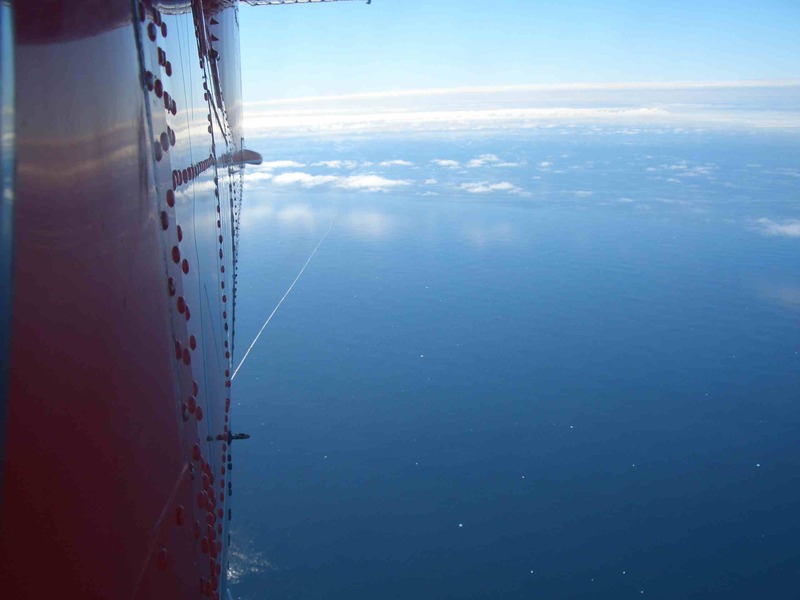 The ability to accurately and simultaneously measure the top and bottom of the arctic ice from a high flying sensor, however, has not yet been established. Operation will be in an area centered on Barrow, Alaska on 270-430 MHz and 9.63-9.79 GHz. The University of Washington filed an application with exhibit for special temporary authority transmit from a free-flying balloon over Washington state on 433.845-433.995 MHz. This is in support of a class project entailing the building and operating of inexpensive equipment to collect atmospheric temperature-profile data. CBS filed an application with exhibits for experimental license to allow testing to “determine if digital spectrum efficient communication radios, capable of simultaneous voice and data channels, will improve the efficiency of its remote field news gathering and if the known latency and ‘cliff effect’ resulting from digital communications might adversely effect news gathering operations. While CBS believes that the benefits of using digital spectrum efficient radios are well advertised, the resulting audio latency issues experienced by the ‘on-­air’ talent during live broadcasts could be problematic.” CBS goes on to state that “As live broadcasts can be affected by digital latency, CBS seeks to determine if this will limit using digital cues and ‘on‐air’ program audio foldback to live talent broadcasting from remote locations. In addition to voice communications, GPS tracking of news crews, electronic script transfers, and teleprompter data will be tested using the proposed equipment and emission.” Operation will be in Denver, Colorado and vicinity on several frequencies near 450 MHz. Qualcomm filed an application with exhibit for experimental license to operate in San Diego, California on 536-548, 578-590, and 656-668 MHz (TV channels 25-26, 32-33, and 45-46, respectively). This is for white-space testing of up to 10 devices, each having a maximum transmit power of 100 mW and bandwidth up to 10 MHz. Microsoft filed an application with exhibit for experimental license to conduct femtocell research, including development of software techniques “to improve the user experience.” Microsoft “plans to operate 3GPP Femtocell Reference Platform (‘FRP’) units from Qualcomm. At the radio layer, the Qualcomm FRP is no different than commercially-available femtocells that use Qualcomm chips. At higher software layers, the biggest difference is that the FRPs will connect to core network emulators instead of connecting to a Home NodeB gateway inside a commercial mobile operator. These core network emulators will run on PC servers, and the FRPs will connect to them via Ethernet. The FRPs will be configured to advertise a particular test mobile network to particular UEs. These UEs will be standard, commercially-available 3GPP cellular phones with SIM cards that allow them to connect to the FRPs.” Operation will be in Redmond, Washington on 824-835, 869-880, 1850-1885, and 1930-1965 MHz. Coldplay Inc., a wholly-owned affiliate of the musical group Coldplay, filed an the application with exhibit for special temporary authority to transmit a 60 kHz-wide signal centered at 869.5 MHz during the 2012 Grammy Awards on February 12 in Los Angeles. According to the application, “Coldplay has recently integrated a distinctive, innovative audiovisual component into its live performances throughout Europe. Specifically, in recent performances, each audience member has received a Light Emitting Diode (“LED”) wristband that is synchronized with the group’s music and stage lighting. These wristbands, which are controlled by a single, centrally located radiofrequency transmitter flash en masse in coordination with the band’s music and stage lighting to create a stunning visual effect throughout the concert hall while simultaneously enabling individual audience members to immerse themselves in the live performance. 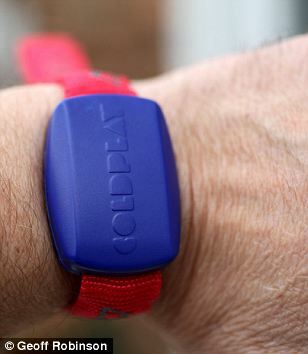 Coldplay seeks STA authority from the FCC to test and demonstrate the underlying RF transmitter that provides command/control instructions to the aforementioned LED wristbands during its performance at the 2012 GRAMMY Award Show.” Coldplay says it received consent from AT&T Mobility LLC, the licensee of that frequency in that area. Cosmoglia, Inc. filed an application with exhibits for experimental license to operate in support of it’s “Dove 2” satellite project. As the company states, “The Dove 2 mission is an internal company technology demonstration experiment to test the capabilities of a low-cost spacecraft constrained to the 3U cubesat form factor to host a small payload. Dove 2 will do this by transmitting health and payload data to the ground. The payload data consists of image data taken from an on board nadir pointing camera. The images will be downlinked over the ISM frequency band at 2.4 GHz and the earth observation frequency band at 8.2 GHz. The dimensions of the spacecraft are consistent with CubeSat and P-POD standards. It is a single unit with the dimensions of 10 cm X 10 cm X 33 cm. The total mass is about 5.8 kg. One important metric of mission success is the ability to build a solar panel/battery/power distribution system that will last for years in orbit, so the mission duration will be one year. The spacecraft will launch on August 31st into an elliptical orbit of 290 km by 575 km with a 64.9 degree inclination.” Operation will be on 1616-1626 MHz, 2401.6-2441.0 MHz, and 8.221-8.229 GHz. The operation on 1616-1626 MHz has been coordinated with Iridium. Orbital Sciences Corporation filed an application with exhibits for special temporary authority to operate three spacecraft telemetry (return) links with its Cygnus spacecraft in support of a mission to the International Space Station. These links are to monitor spacecraft operation. Return links include: Mode 1: spread spectrum operation with NASA TDRSS, Mode 2: low data rate operation with NASA TDRSS (contingency mode only), and Mode 3: high data rate operation with ground stations. Operation will be on 2202.9-2207.1, 2213-2219, 2214.5-2217.5, and 2215.958-2216.042 MHz. Bran Ferren Corp. filed an application for special temporary authority to operate on 2215-2245 MHz at various locations in southern California, Nevada and Utah. This is for the development, testing and demonstration of a “unique airborne video production vehicle” that operates up to 400 feet above ground. Sprint filed an application with exhibits for experimental license to test wireless backhaul systems in the Overland Park, Kansas area on 2305-2310 and 2350-2355 MHz. The tested systems are intended to support Sprint’s Network Vision and related broadband deployment initiatives. The requested frequency bands are in the WCS A-block and are licensed to Nextwave, which has given its consent. Google Fiber filed an application with exhibits for special temporary authority to “test Bluetooth and Wi-Fi protocols and performance (including coordination of Wi-Fi channels between devices and in the presence of foreign signals) within an integrated access point as part of a fiber residential gateway.” Operation will be in Palo Alto, California on 2400-2483 and 5470-5725 MHz. Huawei filed an application with exhibit for special temporary authority to build an experimental network in Plano, Texas operating on 2578-2602 MHz. This is to demonstrate TDD-LTE backhaul technology to wireless operators. Huawei has permission to use the frequencies from their licensee, Clearwire. Enterprise Electronics Corp. filed an application with exhibits for experimental license to “investigate and refine weather surveillance methods to enhance the detection accuracy of severe weather phenomenon. This involves enhancing the design of radar hardware, (transmitters, receivers), and refining software algorithms used to detect, model and display the resulting data. Case studies of weather events are analyzed throughout multiple seasons and refinements are thus integrated into existing radar detection schemes.” Operation will be at Enterprise, Alabama on 2700-2900, 5300-5600, and 9300-9400 MHz. General Dynamics filed an application with exhibit for experimental license to operate in support of development of a government system known as Prophet, not described but apparently a signals intelligence and electronic warfare system. Operation will be in Scottsdale, Arizona on 3424-3452 and 3524-3552 MHz. Qualcomm filed an application for special temporary authority to complete “propagation testing in support of developing next generation wireless technologies and advanced receivers.” “A single fixed transmitter will be configured per the requested frequencies. Receive power will be measured in the immediate area of the fixed transmitter.” Operation will be in San Diego, California on 3650-3700 MHz and 5790-5820 MHz. iRobot Corporation filed an application for special temporary authority to test range, mobility, and other attributes of robots. Operation will be on 4940-4990 MHz in Gaithersburg, Maryland. 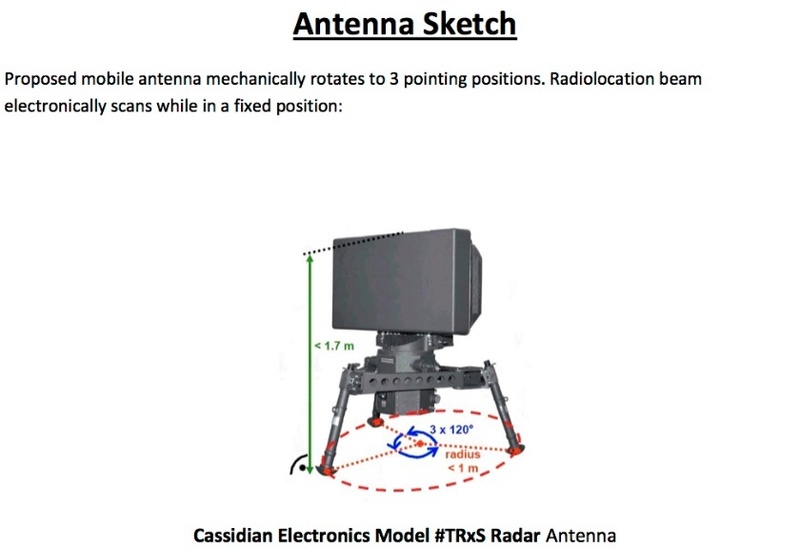 Electronic Warfare Associates filed an application with exhibit for experimental license to test its “Counter – Unmanned Aerial System” radar, said to be capable of acquiring and tracking multiple low-radar-cross-section targets. Operation will be in Mt. Laurel, New Jersey on 5.4-5.9 GHz. Georgia Tech Research Institute filed an application for special temporary authority to “Support testing of the recently launched WGS-4 satellite under Army contract. The Georgia Tech Research Institute (GTRI) provides test and measurement support to the U.S. Army via contract W911W5-11-D-0001. Under this contract, the U.S. Army has tasked GTRI to support testing of the recently launched WGS-4 satellite located at 121.9 degrees west. GTRI will utilize an approved ground terminal to generate various waveforms to test the satellite. The average duty cycle for the overall test is projected to be 3 minutes ON and 8 minutes OFF. All testing will be monitored by the U.S. Air Force Space Protection Program.” Operation will be on 7.90-8.02 and 8.345-8.400 GHz. 3 Phoenix Inc. filed an application with exhibits for experimental license to operate in support of development of an improved periscope detection radar. This work is part of a contract with the U.S. Navy. Operation will be in Wake Forest, North Carolina on 8.51-8.99 GHz. Telephonics Corporation filed an application with exhibit for experimental license to test an Advanced Radar Surveillance System (ARSS). 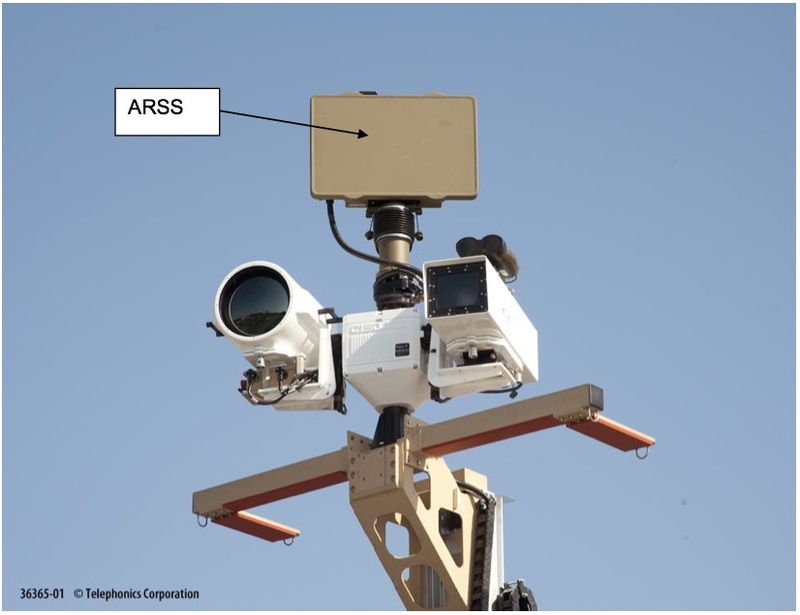 The ARSS is to be used by U.S. Customs and Border Protection at the southern U.S. border. Operation will be in Huntingdon and Farmingdale, New York on 8850 MHz. Lockheed Martin filed an application with exhibit for special temporary authority to conduct “verification of performance of new radar technology for domestic border security for state officials. Data of this improved radar sensor will be used to show performance improvements compared to current operating sensors used by state law enforcement officials for border security.” Operation will be in Syracuse, New York and Sierra Blanca, Texas on 9.2-10.0 GHz. Ultra Electronics Advanced Tactical Systems filed an application with exhibit for special temporary authority to test a ground surveillance radar system in support of a response the company is preparing to an RFP by the U.S. Department of Homeland Security. The RFP pertains to an intelligence, surveillance, and reconnaissance (ISR) system for the U.S. Border Patrol. 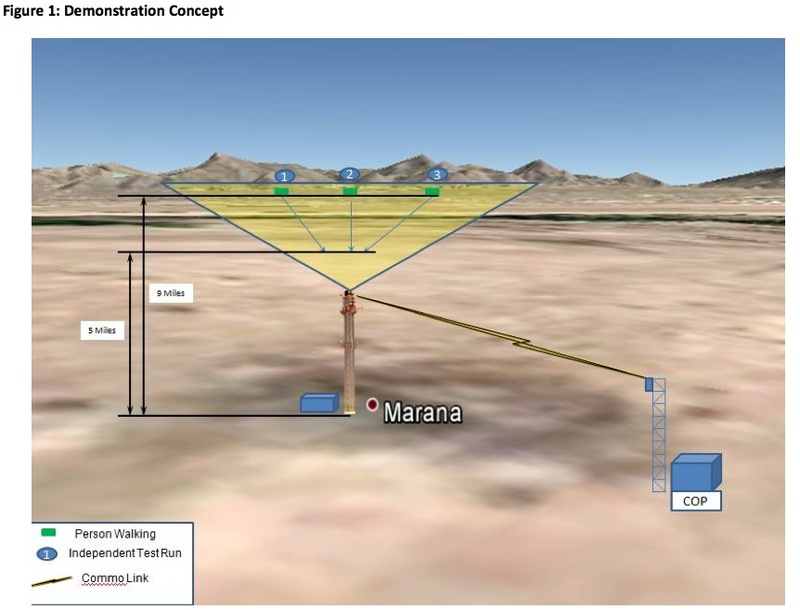 Operation will be in the Marana, Arizona area on 9300-9500 MHz and 15.75-17.20 GHz. Qualcomm filed an application with exhibit for special temporary authority to test Next Gen Air-Ground System antenna performance using a single fixed transmitter on the ground and measuring the received power in an aircraft. As background, Qualcomm says it “recently filed a Petition for Rulemaking to Amend The Commission’s Rules To Establish A Next-Generation Air-Ground Communications Service On A Secondary Licensed Basis In The 14.0 to 14.5 GHz Band, RM-11640. Comments and Reply Comments were filed on the Petition in September and October 2011.” “Qualcomm has also met with the FCC staff in IB, OET, and WTB to discuss the request and the expected performance of the Next- Gen Air-Ground system.” Operation will be on 14.0-14.5 GHz at Bakersfield and San Diego, California. General Dynamics filed an application with exhibits for experimental license to test a prototype border protection system to support “US Government contract pursuits.” The system includes a surveillance radar capable of detecting moving ground targets out to a distance of about 20 miles. Operation will be in Wittman, Arizona on 16.2-17.2 GHz. Google filed an application to extend the duration of previously-granted special temporary authority to “Conduct experiments using test vehicles equipped with automatic cruise control radars in a manner that extends the sensing range of the radars when a vehicle is not in motion. Google is developing advanced driver assistance systems with the goal of improving the safety and convenience of vehicular transportation. Each Google test vehicle contains several off-the-shelf automatic cruise control (ACC) radars certified for use in the 76.0-77.0 GHz band. These radars are used to sense the environment around the vehicles.” Google goes on to say that “Testing the vehicles performance in complex traffic situations (for example, when the vehicle is stopped at intersections, or when a vehicle is about to make a right turn on to a busy road, in which case the range of a left-sensing radar must be sufficient to inform the vehicle to allow high-speed traffic to pass before proceeding) will provide critical data that will guide the development of more effective driver assistance technology. The results of these experiments will inform the need for a longer term experimental license. The location of the proposed experiments will be the San Francisco Bay, California area, extending south to Santa Cruz, California and north and east to South Lake Tahoe, California.” Google says that current FCC radar power limits will be exceeded in its tests when the vehicles are not in motion, but it does think that interference will be a problem. Raytheon Missile Systems filed an application with exhibit for special temporary authority to “demonstrate the effectiveness of using solid state W-band technology for improving high-bandwidth point-to-point communications in harsh environments.” Operation will be in Van Nuys, California on 92-93 GHz or 91-93 GHz (the application and exhibit are inconsistent with regard to frequency). The exhibit states that “Raytheon is working on a new product that uses high bandwidth solid state W-band (91-93 GHz) technology, making it possible to deliver compact, secure communications systems with orders of magnitude reductions in size, weight and power. Reducing the size, weight and power needed by broadband data links is essential when working in harsh climates. Traditional point to point technologies operating in this frequency band use large antennas that are buffeted by wind. The buffeting causes a significant drop in data rates, which leads to inefficient communications, lowering of available bandwidth, slowing of vital communications, and wasted power by the transmitters. This technology offers significant advances in power consumption, rapid deployment, and effective high-speed data transmissions under all conditions.” Raytheon expects to achieve 320 Mbps on a 1 km link. This entry was posted on Monday, April 2nd, 2012 at 5:00 am and is filed under 3G, 3GPP, 4G, Ad-hoc Networks, Amateur Radio, Antennas, Automotive, Aviation, Backhaul, Bluetooth, Broadband Access, Electronic Warfare, Experimental, Femtocells, High Frequency, IEEE 802, IMT-Advanced, Interferometry, LTE-Advanced, M2M, Millimeter-wave, Mobile Broadband, Propagation, Radar, Satellite, Sensors, Smart Grid, Space Communications, Telemetry, Uncategorized, White Space, Wi-Fi. You can follow any responses to this entry through the RSS 2.0 feed. You can leave a response, or trackback from your own site.